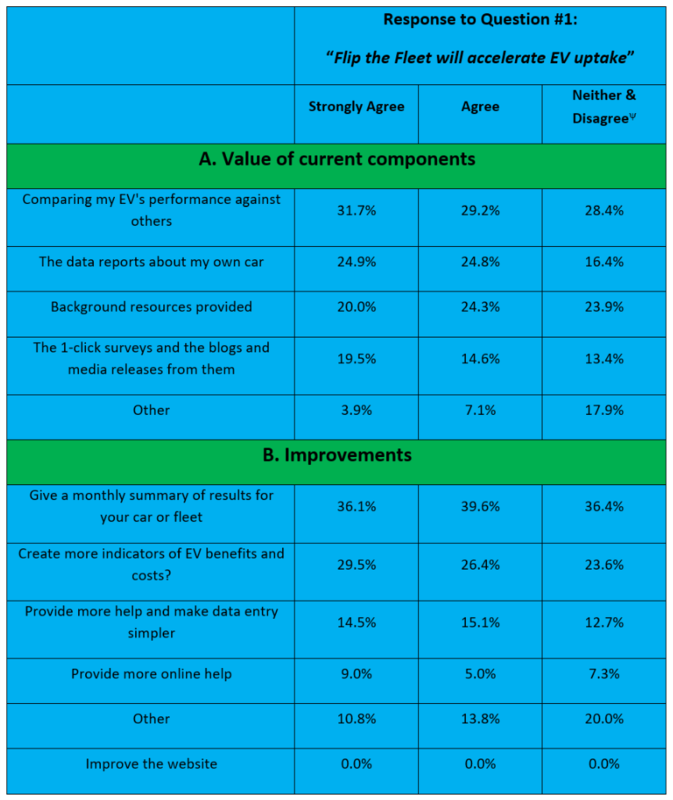 Participants most value Flip the Fleet’s comparative data, particularly in relation to battery health and how well their car is performing compared to other EVs. A sense of community and pride in providing useful information for encouraging EV uptake keeps participants motivated to supply data and answer surveys each month. Improvements were requested to expand data input methods and selected indicators, and to increase levels of public outreach, industry and government engagement, and provision of technical resources. The poll was sent to 798 participants in Flip the Fleet on 25 May 2018. There were 430 responses by 5 June, 312 of which provided detailed comments and answers to the six supplementary questions. Respondents were invited to specify details if they chose ‘Other’ and if they wanted improvements to the website in Question B. Participants most valued knowing how they are performing compared to others in the fleet (30% of all choices for this question; Fig.1). Participants also like tracking their own performance overtime (24%) and also like the access to useful background resources (22%). There was lesser value placed upon the 1-click surveys, blogs and media releases (16%). Amongst the ‘Other’ sources (7%), value was placed upon Flip the Fleet’s ability to help convince potential EV buyers to gain clarity and confidence about EV ownership, while others simply liked knowing they were a part of an EV movement and contributing to the wider community. 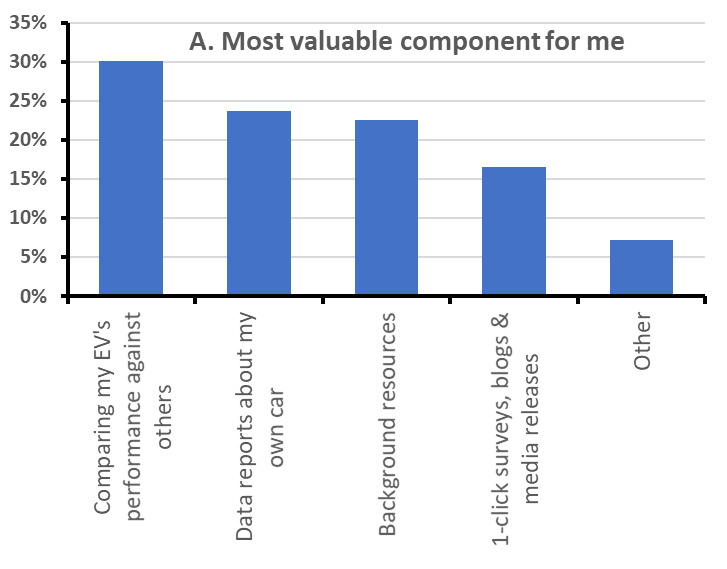 Figure.1 Percent of 498 choices by 312 participants about the most valuable components of Flip the Fleet’s services, May-June 2018. 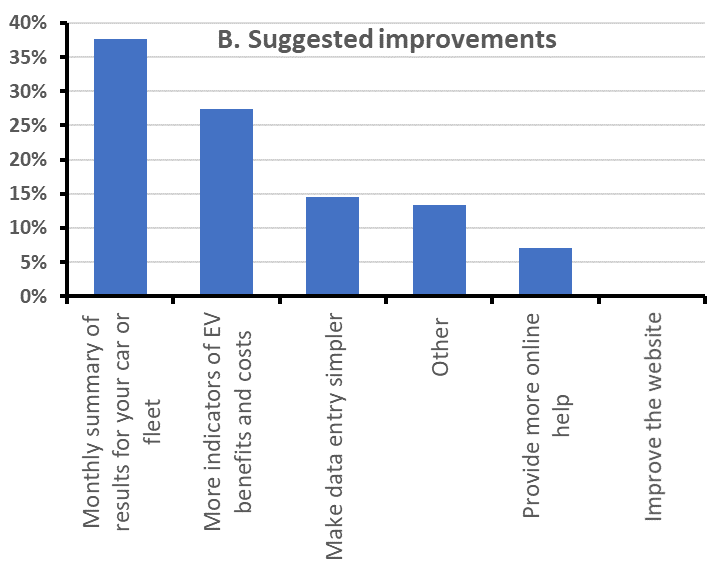 Participants think most improvement will come from providing a monthly summary of results for their car or fleet (38% of all choices for this question; Fig. 2), as well as new indicators that show the benefits and costs of owning and running an EV (27%). Making data entry more simple (14%), and receiving more online help (7%), were thought to bring lesser improvement to the overall Flip the Fleet experience. No one thought the website needed drastic improvement. Figure 2. Percent of 380 choices by 312 participants in a survey of the best ways to improve Flip the Fleet, May-June 2018. There was little shift in the distribution of the choices for both Question A and B between candidates that selected either 1, 2 or 3 & 4 (combined) to the overarching question (#1) about the effectiveness of Flip the Fleet (Table 1). However, sceptics (i.e. participants who chose 3 or 4) were more likely to have chosen ‘Other’ for the components that they most valued or would like to see added to Flip the Fleet’s services. Inspection of the comments suggests the sceptics have only just joined Flip the Fleet and “haven’t yet seen any other data”, or currently value the battery information alone, having “only joined to find out about a solution for 30kW Leaf battery”, or to help build the database to investigate it further. This group would like to see greater engagement beyond those already pro-EV, fuel calculations and analyses that take into account cost-free solar energy contributions, and more technical resources shared as links on the website. In view of the broadly even distribution of responses to questions A and B by people who were more versus less confident that Flip the Fleet is will succeed to accelerate uptake, we have pooled their results in the following more detailed analyses. Here’s a word cloud of the comments you provided to the Flip the Fleet value question (A), using the ‘Wordle’ package: the larger the font, the more times that word appeared in your testimony (Fig. 3). You can see at a glance that you mostly saw the value proposition around data and information issues, especially around the car’s battery. It’s good to see emphasis on people (this is a participatory science project with people and their cars at it’s heart!). New Zealand and owners are part of your emphasis. The same sorts of words predominated in comments on question B. Figure 3. A word cloud of the most frequent 100 words used in your response to the value question of the survey. The larger the word, the more often you mentioned it. Similar words were combined for this analysis to give a better indication of the language used and it’s intent. For example, “compare” encompasses comparing, comparative, compared and comparison, “information” is grouped with info and infographic, and “car” includes cars. Common words such as “EV”, “Flip the Fleet”, “Leaf”, as well as “i.e.”, “e.g”, and “etc.” were removed. Overall, it seems Flip the Fleet is valued at multiple levels. For example, one participant reckoned it provides “A great place to send people who are looking at an EV”. Some become better teachers (“My data gives me confidence when I am sharing with others the benefits of an EV”). Another participant emphasised “The social impact the science will have in decision making to de-carbonize our transport system in NZ”. And thanks to whoever celebrated “being able to email a human at FLIP THE FLEET and getting a personal answer to a problem”. But we are not inspiring everyone, including whoever said “As yet I get no value from Flip the Fleet as I’m not really into the data. A simple summary now and then would help”. Choice! Let’s break down this Wordle to see why it appeals to both current owners and potential EV investors. There’s that word again – data! It seems comparative data is central to the value you see in Flip the Fleet, with several noting that: “I like to get a sense of how others are experiencing their EVs”, “It is good to know what is “Normal” for each type of car”, and “I like the bigger picture that my data informs”. Great, the data you are all helping to provide is adding across the board value and giving a sense of where you place in the EV pack. Sitting here somewhat detached from the EV manufacturing bubble, we agree that “it is important to have a New Zealand independent database” to track EV performance using data collected by our people from vehicles used in our climate (be it environmental, social, or political!). We like this participant’s vision of: “establishing a bank of knowledge of EV use in NZ”. While some saw value in the data itself in terms of tracking performance, others noted the sharing of the data was important for feeling they were directly involved with like-minded people and immersed in a feel good project. One participant voiced that: “Contributing to the body of knowledge about EV’s in NZ is important to me”, while another realised: “It makes me feel a part of the EV community, even if I haven’t met many, yet”. In support of the community feel the data brings to some, one communicated: “I don’t care too much about the stats and data, I’m just trying to help”. So in some ways, the data valued highly by some is merely a bi-product of the EV movement viewed most valuable by others. It’s great these are seen to be working in harmony – bridging science and peoples’ experiences. Next on the value scale is “battery”, with the data from “The Leaf battery degradation study” proving particularly useful. An owner commented: “As I have a 30kWh Leaf comparative data allows me to estimate how much useful life remains”, while another joined Flip the Fleet to gain “information on how the fleet (i.e. the fleet’s batteries) is performing overall, so I can compare my car’s performance”. Survey participants were: “Very pleased” we were “investigating the issue of battery life in 30 kW Nissan Leafs”, while others saw value beyond just battery degradation, stating that overall “the potential improvements to our vehicle would be the most important part”. While “battery deterioration is still front of mind” for quite a few of you, value is seen in Flip the Fleet’s wider ability to gain “more strength from knowledge to address future issues or problems that may arise”. While we try not to get too bogged down in the “30kW battery saga”, it is reassuring that many of you can see other useful components and outputs stemming from the project. Receiving feedback such as: “The experiments coordinated by Flip the Fleet are great, and give us more nuanced information on EV performance in different scenarios” confirms we are filling a need for “original research [into EV battery life] that does not seem to be done elsewhere and is important for the whole industry, as much as it is for the car owners”. 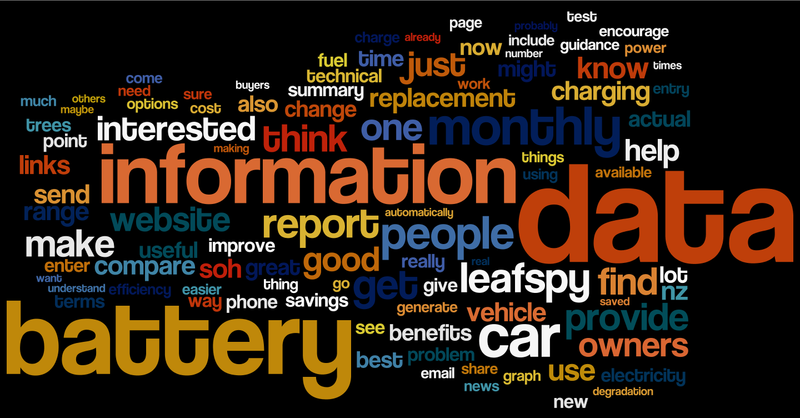 This brings us to the third most valued part of Flip the Fleet according to the Wordle: “information”. After all, the whole point of research is to give us the knowledge we need to more confidently get the most out of our EVs and become informed influencers of change. Several of you commented a somewhat satisfying outcome of participating in data collection was that you were forced to learn the ins and outs of your EV! A comment shared about this experience explained Flip the Fleet has spurred: “The incentive to get to know my car better, in order to fill in the surveys and forms better”, while another is also now better informed: “We’ve had our Leaf for a couple of years and I’m much more familiar with the details”. Bonding with your EV to grab your data can only be a good thing – both for personal use and for sharing your knowledge with others. This already seems to be the case for one EV owner, who said: “My data gives me confidence when I am sharing with others the benefits of an EV. The background resources provide back up to the questions asked, the fears people have about the change”. Flip the Fleet information is also proving useful both for informal chats to potential buyers: “I often link to the page with the SOH and battery graphs for the different year Nissan Leafs to inform people considering buying a Leaf”, and for group education: “I use the Flip the Fleet data for presentations at a local level”. Fantastic! That’s what Flip the Fleet information is there for. We see no point in creating all of this only for it to sit somewhere collecting dust. It is encouraging to hear from you that: “the data is really important but the info we get back is best”. In terms of extending the reach of Flip the Fleet information, some of you saw value in our: “media releases backed up with actual evidence – rather than just PR pieces”, while social media presence was also deemed important. One participant observed that: “I see its value in helping to influence others to join, which is important to me too. Following Facebook posts on EV sites I see more first-time buyers asking the same basic questions than anything else (“We are thinking of buying an EV, can anyone help with some information?”). So there is obviously a need there”. Our current model aims to provide information through the website, and from here we count on you to help us disperse as best you can or as much as you wish to. Whether we can dedicate time and attention to active engagement through multi-media will largely rely on funding outcomes (although we try, we just can’t do everything!) – see the survey blog for Question 5 about funding for more info. We can confirm that: “being able to email a human at FLIP THE FLEET and getting a personal answer to a problem” coupled with “the passion of the people involved to undertake the work to do all these things” will both remain as our goals. We appreciate you taking the time to click, comment on, and wilfully share and share alike so far throughout this EV journey. Room for improvement: what do you most want next? Accruing more of our prized “data” should be front and centre in the future focus judging by your room for improvement comments. Suggestions ranged from general data expansion (“We need as much accumulated data as possible”), to providing more specific EV comparisons (e.g. “a running comparison between my EV and others of similar age”), to differences in daily habits (e.g. “more detailed data on charging & usage habits vs battery degradation e.g. owners that slow-charge to 100% vs 80% daily”). Indeed, more robust data “could encourage the uptake of EVs” by “giving more data comparison options”. Data reporting could include: “additional metrics such as comparing cars SOH by km as well as age”, and “allowing us to see anonymised individual SOH degradation line graphs, not just scatter charts”. It is evident from your feedback that our data and indicators are covering the umbrella aspects okay, but the want for greater detail and various scenarios would improve your time spent with Flip the Fleet. For instance: “Allow an option to put in petrol price and efficiency of a petrol car to calculate actual savings on my EV. My previous ICE car used 98 fuel and so the savings shown on the website are not a true reflection of the actual amount I’ve saved”. It was also interesting to learn that: “the Tesla related data doesn’t measure degradation. This would be really useful to know. It’s hard to measure accurately but I know of nowhere else in the world that is doing this now”. There you go… you have become world leaders in EV monitoring and evaluation by sharing your data and experiences each month! Gathering the data is a breeze and pleasure for some, and a pain for others. We received several suggestions for streamlining data collection such as: “You need to have a way to automatically get data from the car, rather than requiring a manual entering process. For instance, having an interface with LeafSpy that, with the right permissions, uploads data when connected”, the “use of Dropbox to automatically upload car data”, and it simply stated that “I just want to email a screenshot of LeafSpy and have it do the rest for me”. It seems data collection and uploading is currently “a little cumbersome”, and participants have “struggled to get an OBD reader to work with my Apple phone”. Figuring out a way to “push the data from the car so that we do not have to manually enter it”, or linking in with other data collection platforms such as LeafSpy, or perhaps making Flip the Fleet “more tailored to smart phone use” could improve efficiency and reduce frustration surrounding data collection. Immediate, lower-cost improvements could include “links to information on how to use LeafSpy or equivalent or where to get Dongles etc.”, and making the data input portion of the website more mobile-friendly. Shifting gear from data collection to analysis and results…how do we improve on our reporting? One person would like to see data converted to an environmental impact viewpoint: “I think simple graphic metrics such as the number of trees to match GHG savings provide an immediate emotional feedback stimulus which many people will find motivating”. It turns out that several of you would prefer resources and outputs focus solely upon EV performance. “I’ve said before, and I’ll say it again. Please DON’T go into “number of trees” or anything like that. What you are doing now is strongly tied to real data. Once you go into carbon offsets, you open yourselves up to all sorts of criticism that will dilute the power of your message”. Like-minded participants cautioned that: “..the science of how to make that conversion is still fuzzy. Stick to what you are sure about or you open yourselves up to people catching you out”. Perhaps then, an economic viewpoint would be more relatable to the population at large because: “The benefits of cost savings in terms of running and maintaining an EV are a far more desirable “carrot” to dangle under the noses of the general mass of donkeys. There’s so much ignorance out there, but everyone likes to save money”. It may very well be that “pushing GHGs will push a lot of people away. If they switch to an EV to save money, all the other benefits are automatically included”. These comments point towards more of a “money makes the world go round” approach to reporting, which certainly warrants consideration when designing future outputs. While we aim to keep EV information as user-friendly and approachable as possible, some of you would like the technical side of EV ownership to be present and unravelled somewhere on the website. Suggestions included breaking the language barrier (“Technical help, particularly in Japanese interpretation as the majority of the fleet are 2nd hand imports from Japan”), and providing repair and maintenance advice (“Please provide tips on maintaining e.g. rusty shocks and how to prevent and other useful bits and pieces for the novice”), even organising “meetings to help understand the technology and how to make the best use of it”. This could pair well with the recommendations to list: “info on any service providers who specialise in EV maintenance/repairs. Also about battery/cell replacement programs” somewhere on the Flip the Fleet site. Moving right along to the social engagement improvement suggestions! Many of you think we can up the level of active engagement we currently have with the wider population to “make public more aware of Flip the Fleet”. As noted by a survey completer: “When I meet other owners I ask if they are contributors to Flip the Fleet. Most are unaware of the importance of their information to the building of a NZ performance database”. If we are aiming to grow our database, we are going to need more recruits! Greater public engagement could help to “Make it clear that at present, because of NZ’s high level of renewable electricity, changing from driving an ICE vehicle to an EV is the single biggest and most immediate contribution that New Zealanders can make to reducing carbon emissions”. It may involve making “…basic generic information available to interested non-owners”, and having “…some data visible to members of the public who may be interested in EVs and come to the site”. Email could also be a powerful and inexpensive tool to get more people interested in EVs. We could look to implement this idea to: “Periodically send [us] short sharp bullets or links that show the benefits that we can readily share. Send it embedded in an email would be the most effective, as soon as you have to go into a link, you lose interest. Send it with a good to the point subject descriptor. We will share it. Often. Send us the simple maths. Again, to share, in a separate email of its own with a to the point subject descriptor”. Above and beyond public greater outreach, some of you think Flip the Fleet could improve by engaging directly with industry and government and emphasising their roles in the EV revolution. Ideas to: “Get more political…do surveys about government policy and then publish the results”, and put more energy into “Advocacy for EV owners with vehicle problems such as the 30kWh leaf issue” to “encourage Nissan (or a 3rd party) to provide leaf battery changes in NZ at an affordable, fixed price” are all realised as potential game changers, although we need to be careful and smart about our approach. Rounding out the improvement feedback were proposed slight tweaks to the existing website and data analyses such as a preference for “the font colour to be black so it is easier to read”, and the request to make “the GHS savings more accurate by allowing the specification of fuel economy of the replaced ICE vehicle rather than using some average figure”. We were asked to “please devote a major page to the fleet SOH graphs and change the x axis on those graph to base 0 so they don’t look as bad as they do and give a false negative impression”, and made mindful of the fact that “the reports & surveys are getting so numerous that it takes a long time to gather their most valuable information”. The email add-on was again mentioned, but this time in the form of “an email reminder just before the end of the month to send in (I know I could set one on my phone)”. Aside from the above, many of you thought what we have built to date is great! “I’m really happy with what you’re doing. I wish that I had more time available to support what you are doing in a more meaningful way!”. We received timely motivation to “keep up the good work on how to improve the performance of my EV”, and were reassured that “continuing to reinforce the fundamental benefits of EVs for the people who are interested but not yet convinced” would retain Flip the Fleet’s valued properties. It’s rewarding in itself to know that someone has “referred a friend [to you] for advice online which was extremely useful to her in buying her EV”, while others think we are “doing a good job of getting data out there for people”. Cheers team! It means a lot. Naturally we are chuffed by your positive feedback. It seems that many of the design features we identified at the outset are working to keep many of you gifting New Zealand your data and knowledge every month (take a look at Report #1 at https://flipthefleet.org/resources/research-reports/ for a review of overseas experience in citizen science. The high response rate and honest feedback in this and previous 1-click survey is just one example. Challenge of the veracity of the indicators and debate about their meaning shows that you are far from just being “data slaves” – you are taking a strong responsibility for the integrity and use of the information that we are pooling together in a communal database. The pleasure you get out of making a difference and being part of a club of citizen scientists is the most important sign of all that Flip the Fleet has a sustainable future, provided it can secure resources to harness your individual energy and knowledge and reflect it both back to you and out to prospective EV purchasers in the wider community. Which components are most valuable? What improvements would add value? Repairs, maintenance and replacements – some direction? Just keep doing what we’re doing!